A little over a year ago I mentioned a project I was working on about prediction and evolution of E3 ligase targets (aka P1). As I said back then, I am free to risk as much as I want in sharing ongoing results and Nir London just asked me how the project is going via the comments of that blog post so I decided to give a bit of an update. Essentially, the project quickly deviated from course since I realized that predicting E3 specificity and experimentally determining ubiquitylation sites in fungal species (without having to resort to strain manipulation) were not going to be an easy tasks. So, since the goal was to use these data to study the co-evolution of phosphorylation switches (phosphorylation regulating ubiquitylation) it makes little sense to restrain the analysis specifically to one form of post-translational modification (PTM). After a failed attempt to purify ubiquitylated substrates the goal has been to come up with ways to predict the functional consequences of phosphorylation. We will still need to take ubiquitylation into account but that will be a part of the whole picture. We have set up a notebook where we will be putting some of the results and ways to access the datasets. Any new experimental data and results from the analysis will be posted with a significant delay both to give us some protection against scooping and also to try to guarantee that we don't push out things that are obviously wrong. This brings us to a disclaimer... all data and analysis in that notebook is to be considered preliminary and not peer reviewed, it probably contains mistakes and can change quickly. I am currently colaborating with Raik Gruenberg on this project and we are open to collaborators that bring new skills to the project. We are particularly interested in experimentalist working in cell biology and cell signalling that could be interested in testing some of the predictions we are getting out of this study. This will be all for now. I think we are getting interesting results from this analysis on the evolution of the functional consequences of phosphorylation events but we will update the notebook when we are a bit more confident that we ruled out most of the potential artifacts. I think the hardest part about exposing ongoing projects is having to explain to potential collaborators that we intend to do so. This still scares people away. I'll end with a pretty picture. 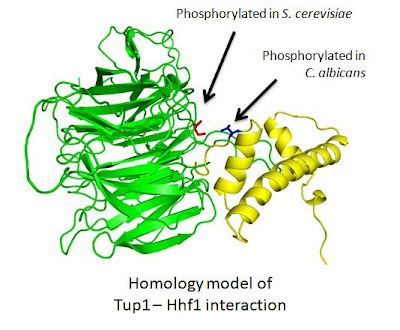 This is an image of an homology model for the Tup1 -Hhf1 interaction. Highlighted are two residues that are predicted by the model to be in the interface and are phosphorylated in two different fungal species. This exemplifies how the functional consequence of a phosphorylation event can be conserved although the individual phosphorylation sites (apparently) are not.